Anya Fernald's farinata. Photo courtesy of Ten Speed Press. Long before her days as slow-food entrepreneur extraordinaire, Anya Fernald worked as a cheese distributor in Sicily, where she learned the secrets to Italian cooking from old Italian nonnas who invited her into their kitchens. These experiences served as the inspiration for her cookbook of recipes that harken back to Italian cuisine's humble origins, traditions she feels many modern chefs have left behind. This is one of my favorite starters, a thin, simple chickpea flour pancake with crispy edges. It's terrific with nothing more than some cracked pepper, but it can be enhanced with a topping of thinly sliced mortadella or strips of roasted red peppers. Though the batter can (and should) be made ahead, cook the farinata just before you plan to serve it—it's best fresh from the oven. A rule of thumb: The simpler a recipe is, the better the ingredients need to be. In this dish, the flavor and consistency rely entirely on the quality of the chickpea flour. I suspect that many of the American chickpea flours are stored longer than the Italian ones, as I've found that when I make this dish with American chickpea flour, the pancakes taste a bit stale and drier than I'd like. I'm typically a proponent of sourcing ingredients locally, but in this case I suggest you seek out an Italian-brand chickpea flour online or in a specialty store. This makes one 12-inch farinata. If you do not have a 12-inch cast-iron pan, you can use a smaller pan and make a couple of them. The important thing to note is that the batter should be no deeper than 1/4 to 1/2 inch in the pan or it will not get crispy. Combine the water and salt in a medium bowl and stir to dissolve the salt. Sift the chickpea flour into the salted water a little at a time, whisking to avoid lumps. Cover and let stand at room temperature for three hours. Put a 12-inch cast-iron frying pan in the oven and preheat the oven to 500°F. Skim any foam off the top of the chickpea batter and discard; the batter will be very liquid. Stir in 3 tablespoons of the oil. When the oven is hot, remove the preheated pan, add the remaining 1 Tbs. oil, and tilt the pan so it coats the bottom. Pour in the batter and return the pan to the oven. Bake until the edges are deeply browned and a golden, blistered crust forms on top, about 10 minutes. Remove the pan from the oven and carefully remove the farinata with a spatula. 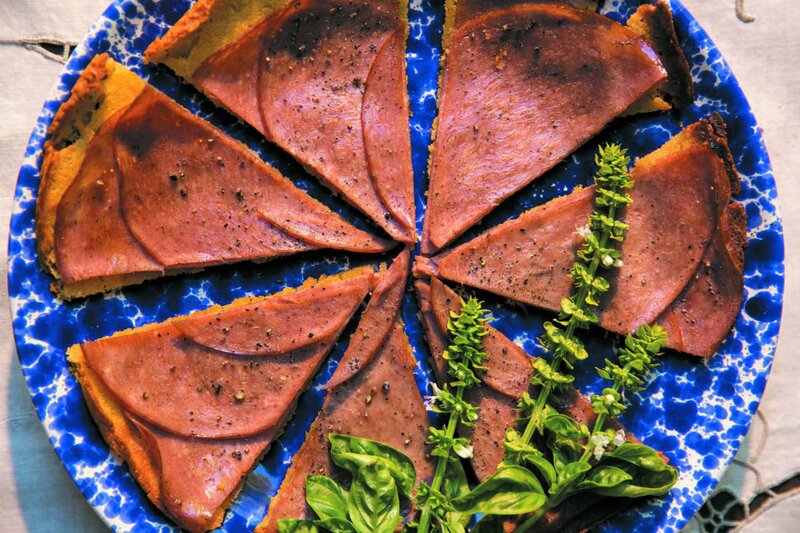 Crack some black pepper over the farinata and arrange slices of mortadella on top, overlapping slightly. Cut the farinata into wedges and serve warm. 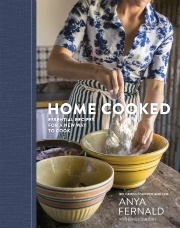 Buy Home Cooked: Essential Recipes for a New Way to Cook, by Anya Fernald. Excerpted from Home Cooked: Essential Recipes for a New Way to Cook (Ten Speed Press; April 2016). Anya is the co-founder and CEO of the Belcampo Meat Co. Follow her on Instagram and Twitter. She travels for the release.